Lots of articles address traveling by air with children, but few of them are geared to grandparents traveling with grandchildren without parents. Most grandparents won’t be traveling solo with babies or toddlers, so they don’t need all the info about baby formula and strollers. What they do need is advice about handling child passengers preschool-age and older. It's also really important to be able to sit together on the plane so be sure to try to secure seats with your grandchildren. With that in mind, here are some air travel tips generated especially for grandparents traveling with grandchildren. Talk with the kids’ parents before you make plans. They know their children better than you do and will be able to give you lots of good information. Make sure you take notes. On the other hand, don’t be afraid to do things your way as long as you’re not breaking the parents’ rules. While you are with the kids' parents, get the documents you'll need to travel with your grandchildren. Don't make your first trip an airplane trip. 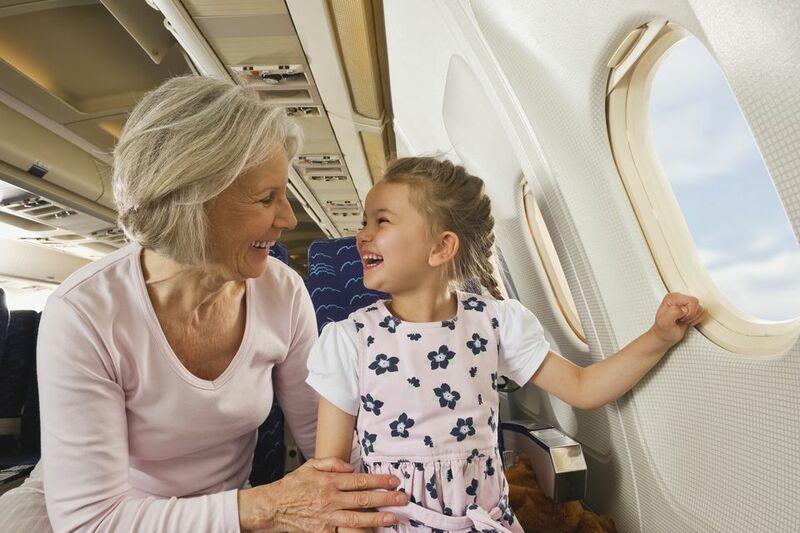 Don’t take the grandchildren on a trip involving air travel if you’ve never traveled with them before. Try a short overnight trip first to get your feet wet. Prepare the grandchildren before you go. Don’t, however, overwhelm them with a lot of information. They’ll deal with most situations just fine. Be prepared to sit in your seat most of the time. Don’t kick the seat in front of you. Introduce older kids to the concept of air travel etiquette. Teach them the different requirements of the aisle seat, the middle seat, and the window seat. Teach them to keep their bodies and their possessions neatly corralled within their area and to anticipate the needs of their seatmates. Teach them not to recline their seat unnecessarily and to warn the person behind them if they must recline their seat. Warn children who are old enough to understand not to make jokes about bombs. Authorities are unlikely to detain a child, but any references to bombs could cause delays. Book non-stop flights if possible. Most airline hassles come in the form of missed connections. If you have no connections, you can’t miss them. Print or download boarding passes online. Do this before you get to the airport if your airline offers that option. For starters, parents can travel with massive amounts of paraphernalia and negotiate all kinds of difficulties. They are young. But grandparents need to simplify. Apply for a Known Traveler Number (KTN). Qualified travelers don't have to remove belts, shoes, or light jackets. They don't have to remove laptops from bags or even take out their bagged liquids. These may seem like small inconveniences, but they make a big difference when traveling with kids. You can get a KTN through the TSA Pre-Check program, but it takes time, so be proactive. There is also a non-refundable fee. Reduce carry-ons. Prevalent practice in air travel today, even with stricter rules about carry-ons, seems to be to carry on as much as possible. Some people boarding airlines could probably survive in Antarctica for a week with what they have in their carry-ons. You’re a grandparent. Swim against the current. Keep carry-ons to a minimum. Minimizing carry-ons makes going through security easier, lessens the chance of something being left behind, and reduces the number of bags you have to look through to find the Tylenol. If traveling with older grandchildren, it’s okay to let them have their own carry-on as it will add to their comfort level. Also, it’s good to start the trip by making them responsible for their own things. Know the rules. When it comes to liquids, gels, and aerosols, remember the 3-1-1 rule. They must be three ounces or less and placed in a single quart-sized, zip-top plastic bag. The TSA limits such bags to one per traveler. If you can consolidate into one bag for grown-ups and one for children, that would be simpler yet. The bags must be removed from carry-ons and placed in a bin or on the conveyor belt for screening. Know the exceptions. There are exceptions to the rules about liquids, gels, and aerosols. Baby formula, breast milk, and juice are not subject to the three-ounce limit, but you won’t need to worry about those if you’re traveling with older children. Prescription and over-the-counter medications are also exempt from the three-ounce limit. Dress simply. Unless you are qualified for TSA PreCheck, you'll have to remove shoes, belts, and jackets. Avoid shoes with shoelaces, extraneous outerwear, and belts. Go through handbags, computer cases, and other small carry-ons ahead of time to make sure that there is nothing that will cause a problem. Use curbside check-in. Go for this option if it’s not too backed up. Choose your boarding time wisely. Boarding early extends the time you have to sit on the plane. On the flip side, early boarding minimizes the chances that someone else will be in your seat and the chances that your carry-on will end up having to be checked due to lack of room. Take things to amuse the grandchildren. But don’t overdo it. Remember that everything has to be carried on and carried off, so the smaller the better. Portable game players and digital tablets can be life-savers. Download movies to a tablet and the kids can watch them even if the airplane doesn't have Wi-Fi. Cheaper electronic games such as electronic Yahtzee are fine, but be sure the sound can be turned off. Low-tech works, too. If your grandchildren are readers, be sure they have a good book. Some other low-tech choices are playing cards, Sudoku, or other puzzle books. For younger kids, choose kids’ playing cards (simplified rules with fewer cards in a deck), BrainQuest flip cards, or travel-sized MagnaDoodle or Etch-a-Sketch. Don’t forget pen and paper for drawing and for playing tic-tac-toe or hangman. Pack non-messy snacks. Be creative when it comes to bringing snacks on the plane. You can bring grapes, string cheese, fruit snacks, and Goldfish crackers. Once again, whatever doesn’t get eaten must be carried off the plane, so don’t go overboard. If flying with a grandchild with a peanut allergy, you will have to take extra precautions. Avoid meltdowns. Meltdowns and tantrums are never pleasant, but on an airplane, they can be especially distressing because they disturb the other passengers. Sometimes meltdowns are triggered by unforeseen situations, but the likelihood can be reduced by not letting children get too tired, hungry, or hot. Also, children who dislike the unexpected are especially prone to meltdowns. This is where the thorough preparation that you did ahead of time will pay off. If, in spite of your best efforts, a meltdown occurs, stay calm. Remember what doesn't work. Asking questions, being logical, and getting angry may escalate the episode. Talking in a calm voice may work, or try offering a distraction such as food or a toy. Have your ground transportation arranged. If renting a car, it’s worthwhile to become a member of the rental company’s express service. These services are generally free. Because your preferences are filed ahead of time, the paperwork is greatly reduced. Some companies offer a special line for express customers. You will have to join the membership ahead of time, however, or you won't save any time. Know all the details. Whatever type of transportation you are taking out of the airport, know all the details ahead of time—where to board, whether you need exact, etc. Most of all, remember to have a grand time!